Gujarat is known for its many exotic destinations and is also considered as one of safest places, especially for solo travellers in India. 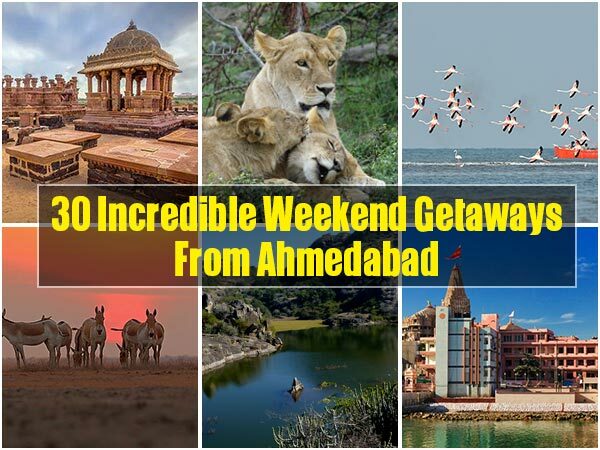 Explore tons of amazing weekend getaways from the former capital of Ahmedabad or Amdavad. Visit the thick forests of Gir, pristine beaches at Daman and Diu, ancient temples at Dwarka and Somnath, historical places of Lothal and Modhera, salt marshes at Kutch and more. Take a look at these amazing weekend getaways from Ahmedabad for your next holiday. Located near Sanand village of Gujarat, the thriving lake and marshes of Nal Sarovar Bird Sanctuary are home to numerous birds, especially during the migratory seasons of spring and winter. It is also the largest wetland bird sanctuary in Gujarat. Visit the bird sanctuary if you are a shutterbug or enjoy observing the chirping of colourfully winged creatures. Famed for being the milk city and milk capital of India, the industrious town of Anand is located in Gujarat, about 77 km from Ahmedabad. It is here where the White Revolution or the Milk Revolution was initiated by Verghese Kurien, who is known as the Father of the White Revolution in India. Anand is home to the famous Amul Dairy. Located at a distance of about 78 km from Ahmedabad, Lothal is an archaeological site where the ancient Indus Valley Civilisation flourished. Lothal is considered to be one of the most prominent cities of the ancient civilisation and the impressive remnants of the great Harappan Civilisation can be seen here. If history fascinates you, then Lothal is a must-visit place for you. Located in the Mehsana district of Gujarat, Modhera is known for its Sun Temple, an exquisite architectural marvel that is believed to be over a thousand-years old. The incredibly designed and constructed monument has been a major attraction for artists and photographers from all over the world. The iconic stepwells and an annually held Modhera Dance Festival also attract travellers from across the globe every year. Vadodara, often called Baroda, is one of the largest cities in Gujarat. The city has many heritage structures and monuments still standing tall, telling tales from the era bygone and drawing many tourists, travellers, historians, and art and architecture enthusiasts. Nyay Mandir, located in the heart of Vadodara, Maharaja Sayajirao University of Baroda and the Lakshmi Vilas Palace are some of the places that you mustn't miss when in Vadodara. Famed as the ancient fortified city of Gujarat, Patan is known to have been its historical capital for 650 years. It is most famous, especially among travellers, history buffs and photographers for its iconic stepwell - Rani ki Vav or the Queen's Stepwell, a UNESCO World Heritage Site. Apart from the stepwell, many other prominent structures and monuments add to the beauty of this ancient capital of Gujarat. Located in the Panchmahal district of Gujarat, the archaeological park of Champaner-Pavagadh is a UNESCO World Heritage Site. The place is literally a treasure trove for history buffs with numerous historical and heritage structures, unexcavated sites, prehistoric sites, old palaces and forts dating back to several thousand years. The site itself is located by the foothill of the Pavagadh Hill and the hill is believed to be one of the oldest rock formations in India. Also known as the ancient Polo City, with its name derived from a Marwari word 'pol' which means 'gate', Vijaynagar is located close to the Gujarat-Rajasthan Border. Vijaynagar is also the ex-princely state of British India and is famous for its lush Pol Forest (also called Polo Forest or Vijaynagar Forest), glorious waterfalls, rich wildlife and a number of impressive monuments and structures. Known for one too many must-visit places for every kind of traveller, Bhavnagar is the coastal city of Gujarat. Given its geographical location, the city has always been an important centre for commerce and trade. Bhavnagar is also referred as ‘Gathiya Hub', gathiyabeing a popular Gujarati snack, especially amongst the foodies. Swaminarayan Temple, Jain temples, Takhteshwar Temple and Blackbuck National Park are some of the places you shouldn't miss when in Bhavnagar. While it may look like a typical city - busy and crowded - from the outside, Rajkot in Gujarat has more than what meets the eyes, especially for its travellers. With the rustic buildings and museums on one hand and modern high streets on the other, Rajkot is a blend of the new and the old. Visit the Kaba Gandhi No Delo - a place where Mahatma Gandhi spent a part of his childhood, Rotary Dolls Museum, Watson Museum, Pradyuman Park, Buddhist Caves and many other interesting places. Huddled in the Aravalli Ranges of Rajasthan, Mount Abu is a popular hill station that is located close to the Gujarat-Rajasthan Border. It is also a significant place of pilgrimage for the Jain population of India with its centuries-old, exquisitely carved Jain temples, especially the ornate Temples of Dilwara. Being the only hill station in the desert state of Rajasthan and home to serene forests, rivers, lakes and waterfalls, Mount Abu is also called an ‘oasis in the desert'. Famed for being the former capital of Mewar, the ‘City of Lakes' Udaipur is one of the major tourist destinations of Rajasthan. Also called the ‘Venice of the East', Udaipur is known for its numerous artificial lakes. The beautiful royal palaces and monuments spread across the city, draw tourists from all over the world. Get a taste of royal indulgence with a visit to this city. Located by the Tapti River, closer to the Arabian Sea, the city of Surat in Gujarat used to be a major seaport and centre of trading in the olden days. It is famous for silk and textile industries and diamond cutting and polishing industries, and is, therefore, also called the Silk City or the Diamond City of India. The Dumas Beach, Sardar Patel Museum and Gopi Talav are some of the many tourist attractions that can be visited when in Surat. Located on the foothills of Girnar, Junagadh is a popular city in Gujarat. With its name meaning an old fort, Junagadh with its forts, caves, heritage structures, is a haven for history enthusiasts. The Girnar hills, which are known to be older than the Himalayas, Ashokan Rock Edict, Buddhist Caves, Mahabat Maqbara are a few amongst the many interesting places to visit in Junagadh. This town in Rajasthan gets its name from the Rajsamand Lake - a 17th-century artificial lake built by the Maharaja of Mewar. Also known as Rajsamudra Lake, it is one of five famous lakes of Mewar. Sunsets and sunrise are the best times of the day to visit the lake, especially if you are a photography enthusiast. Visiting at these hours will reward you with some of the most stunning pictures of the lake, sky and surrounding landscapes. Filled with heritage structures and monuments, the city of Bhuj in Gujarat is famous for its centuries-old, impressive buildings. This district headquarters of the Kutch district is associated with many important historic and prehistoric events. Hamirsar Lake, Aina Mahal, and Prag Mahal are some of the many places to visit in Bhuj. The shopaholics can also shop forcolourful Kutchi handicrafts from the many markets of Bhuj. Gir Forest National Park and Wildlife Sanctuary, also known as Sasan-Gir, is one of the oldest sanctuaries in India. It is also famed for being the only home to the majestic Asiatic lions in the world. With a rich ecosystem and rich flora and fauna, the Gir forest is a must-visit for every nature-lover and wildlife enthusiast. One of UNESCO World Heritage Sites in India, Kumbhalgarh or the Kumbhal Fort is situated in the Rajsamand district of Rajasthan. It is considered as the second largest and second most important fort of Rajasthan after the Chittor Fort. The impressive fortress is perched on the westerly ranges of the Aravalli hills. It is a sight to behold when the majestic fort is lit up after sundown each day. The ancient Indus Valley Civilisation thrived at the very site where Dholavira, located in the Kutch district of Gujarat, sits today. It is one of the two largest Harappan sites and one of the most prominent ones in India. If history interests you, then you must visit this ancient city that now lies in ruins but has the charm to transport you to the era bygone with its impressive structure, layout and planning. The twin islands of Daman and Diu in the Arabian Sea form the second smallest union territory on the west coast of India. With the remnants of Portuguese colony dating back to the 1500s, one can see beautifully constructed old churches and forts. Other interesting places to visit are the Jain temples, Nadia Caves, Jampore and Devka Beach among many others. The city of Chittorgarh in Rajasthan holds a significant place in the Rajput history. Also pronounced as Chittaurgarh, the city is home to the magnificent Chittor (or Chittaur) Fort - the largest fort in India and Asia. The fort has seen and withstood major events in history such as three major sieges by the Muslim invaders and Jauhar - mass self-immolation by the women of the Rajput warriors. The Chittor Fort also houses a temple dedicated to Meera - a celebrated mystic poet and Rajput princess of the 17th century. Mandu or Mandavgad is an ancient fort city located in Madhya Pradesh, which explains the architectural heritage and the impressive landmark buildings that the city is home to. With its many architectural marvels, including but not limited to the Hindola Mahal, Jami Masjid, Rani Roopmati Palace and Pavilion, Jahaz Mahal, Baz Bahadur Palace and Rewa Kund, Mandu is a must-visit for every history buff, photography enthusiast, and art lover. The capital city of the Indian union territory of Dadra & Nagar Haveli, Silvassa is a known for its exotic beauty filled with lush landscapes. The region is also home to many indigenous tribes and therefore, travellers can learn so much about the culture, art and traditions here. A tribal museum located in Silvassa gives insight into the rich heritage of the place. Travel to Silvassa for a relaxed and enriching travel experience. Famous for being the birthplace of Mahatma Gandhi, Porbandar is asignificant placein Gujarat. Not only is the place historically significant but also offers many interesting places to visit to the travellers along with some impressive heritage and spiritual destinations, a bird sanctuary amongst many others. Take a journey from Ahmedabad to Porbandar for a relaxed weekend. Saputara - the lone hill station of Gujarat is a perfect place to unwind and rejuvenate. Located in the heart of the Sahyadris, the hill station offers a pleasant weather throughout the year with a surge of tourists, especially during the summers and monsoons. Saputara is home to beautiful waterfalls, forests and wildlife. Visit the charming hill station of Saputara for a leisurely weekend break from Ahmedabad. Surrounded by the Arabian Sea in the west, Gulf of Kutch in the south and Rann of Kutch in the north, Kutch in Gujarat is virtually an island. Nicknamed as India's Wild West, it is a stunning destination with a unique landscape. Explore the amazing Banni grasslands, stunning vistas, salt marshes, wildlife sanctuaries, abandoned ghost towns, Siyot caves, forts and more. Located on the banks of river Narmada, Maheshwar is a town in Madhya Pradesh. Maheshwar was the erstwhile capital of the historical province of Malwa in Madhya Pradesh. The peaceful riverside town of Maheshwar gets its name from Hindi words ‘Maha Eeshwar' meaning ‘the great God' - a title for Lord Shiva, and has many interesting legends and myths associated to it. The historical town is famous for numerous heritage monuments including beautiful palaces, forts and temples. Located on the west coast of Gujarat, Somnath in Prabhas Patan near Veraval, is one of major places of pilgrimage in India. It is famous for the Somnath Shiva Temple, which is believed to be the first of the 12 Jyotirlinga shrines in India. The shrine is located at a very serene location, facing the Arabian Sea. Even if you aren't a believer, it is worth visiting the place for a number of things including visits to the Somnath Beach, Buddhist Caves, and the delicious Gujarati cuisine. One of seven ancient towns, called Sapta Puris in mythology, Dwarka is filled with numerous amazing myths and lore. It is famous as a place of pilgrimage and for the grand Dwarkadheesh Temple - dedicated to Lord Krishna, the king of Dwarka. It is believed that the ancient city was made of gold and was submerged in the deep blue of the Arabian Sea. The picturesque Dwarka Beach and lighthouse offer stunning views of the Arabian Sea. Suryamal is the lesser-known hill station located in the Thane district of Maharashtra. The charming place has the highest peak in the region and its surrounding verdant hills and offbeat trails make it a popular destination amongst the trekking enthusiasts. Especially during and post-monsoon the place transforms into a gorgeous destination attracting the city dwellers from Mumbai, Pune, Nashik and Ahmedabad.